So You Want to Know a Little More About Elaine L. Chao? 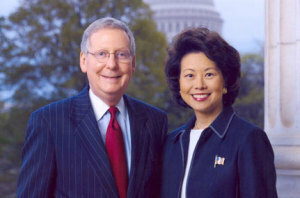 Elaine Chao and Husband, Mitch McConnell. There have been quite a few splashes in the news recently about Mitch McConnell’s wife, Elaine Chao. For those who don’t know her, here is a brief biography to offer a little more information! Elaine Chao is the first Kentucky woman ever named to the President’s cabinet in history. She grew up in a family of six daughters and arrived in America at the age of eight not speaking a word of English. Her experience with her family transitioning to a new life in this country motivated her to devote most of her professional career to ensuring that everyone has the opportunity to build better lives. Secretary Chao has a distinguished career in the public, private and nonprofit sectors. While she was Secretary, the Department of Labor achieved record results in workplace safety and health and focused on increasing the competitiveness of America’s workforce. Prior to the Department of Labor, Secretary Chao was President and Chief Executive Officer of United Way of America, where she restored public trust and confidence in one of America’s premier charities after it had been tarnished by financial mismanagement and abuse. As director of the Peace Corps, she established the first programs in the Baltic nations and the newly independent states of the former Soviet Union.Her government service also includes serving as Deputy Secretary at the U.S. Department of Transportation, Chairman of the Federal Maritime Commission and White House Fellow. She has also worked in the private sector as Vice President of Syndications with BankAmerica Capital Markets Group and Citicorp. Secretary Chao earned her MBA from the Harvard Business School and an economics degree from Mount Holyoke College. Recognized for her extensive record of accomplishments and public service, she is the recipient of 34 honorary doctorate degrees. She is currently affiliated with a think tank in Washington, the Chair of the Ruth Mulan Chu Chao Foundation, a frequent commentator on television and a popular speaker on jobs and the economy, and serves on a number of corporate and nonprofit boards. A proud Kentuckian, she is married to Kentucky’s United States Senator Mitch McConnell who’s also the Republican Leader of the United States Senate. You can learn a bit more about Elaine by visiting her website: www.ElaineLChao.com.